Murud Janjira Fort also known as “Janjira Fort“ is located in the western coastal area of Maharashtra, India. “Murud“ is the name of the village which is present in the Raigad district of Maharashtra. The name “Janjira” comes from the Arabian word “Jajira” which means “Island”. This fortress is truly invincible, no one can win this fort. British, Mughal, and Marathas attacked this fort many times but they didn’t win it. Built By: This invincible fort was built by Siddi Johar. It took 22 years to build this stronghold. 22 Siddiqui rulers had ruled on this fortress. Their last ruler was Siddiqui Mohammad Khan. On 3rd April 1948, this fortress was included in the Indian territory. Built In: The fortress built in the 15th century. In 1508, Malik Ahmad Nizam Shah died. His 7-year-old son, Burhan, came to Nizamshah. Two Nizamshahi chiefs of Mirzahalli and Kalbiali came to Dandarajpura in North Konkan. In the same period, pirates were robbing fishers on every day. At that time Ram Patil was the leader of all fisher community. Nizamshah sent a Piramkhan to manage Ram Patil. Piram khan fainted Ram Patil with liquor and took Medhekot into his possession. In 1532 Piram khan was died and Burhan Nizam Shah was appointed here. In 1567, as per the directions of Hussein Nizamshah, this fortress was built in stones instead of a wood. This work is done Till 1571, it became known as ‘Fort Mehrub’. Later in 1857, Alarg Khan was appointed here. After his death in 1612, his son Ibrahim Khan was taken the control of this fort. During the period of 1618 – 1620, This fort was under control of Siddiqui Surud Khan. After this, till 1947, 20 Siddhi Nawabs claimed the possession of Janjira fort. Due to lack of revenue coming from the Murud area, Malik Amber split this land from his sultant and give the responsibility of Siddiqui Ambarsanak. This is why Siddiqui Ambarsanak considered as a founder of Janjira. 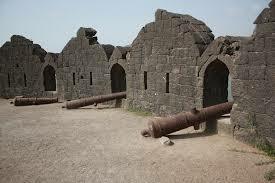 The great Maratha king “Shivaji” attacked many times but didn’t succeed to win this fortress. You can reach this fort using ferry boat from Rajapuri Village. This boat will take you at the entrance of this fort. On the wall of the door, there are sculptures painted on a particular type of stone. It is known as Gajant Lakshmi’s craft. After crossing the steps we can see the large armory tanks. The biggest tank name is “Kaladbangdi”. Following are some of the places to visit in the fort. Peerpanchayatan: After entering the main gate of the fort there is another door on the left side. On the right side, there is a construction like the room. This is called Peerpanchayatan. Surul Khan’s Palace: 3-storey building present in the fort campus is known as Surul Khan’s Palace. Over the years, this palace is in bad condition now. Lake: There is a beautifully built Kumbh lake is present on the north side of this castle. This lake is about 20m in diameter. There are four reservoirs on the four corners. Timings: This fortress remain’s open on all weekdays. Tourist can visit this place between 7 am to 6:30 pm. Entry Fee: There is no entry fee required to visit this historical palace. But if you want to take a Guide then you need to pay Rs.30/person for the guide. Visiting Hours: It takes 1.30-2.00 hours to view this historical invincible castle. By Road: If you are coming from Mumbai or Pune then you need to reach Alibag first. From Alibag you can take a private or public transport to reach Murud(Rajapuri) village. From Rajapuri village boat service will drop you at the fort. By Railway: Nearest railway station is Panvel. You need to use state bus transport or outstation cab service to reach Alibag. From Alibag reach Janjira by road. By Boat: Tourist can use a ferry boat service from Gateway of India Mumbai Or from Dighi. This ferry boat will drop you at Alibag. By Air: The nearest airport is Mumbai. Use above three ways to reach Murud Janjira fort from Mumbai. October-February is the best time to visit this invincible fortress of Janjira.